Most households have no idea where their electricity comes from. As long as the lights come on when they flip a switch, that’s all that matters. But just knowing exactly what the composition is could be enough to inspire a change. To this end, the Environmental Protection Agency has a tool–the Power Profiler–that lets anyone with a bit of curiosity and about 2 minutes of spare time get some idea of where their electricity comes from and the impact that it has, as well as some tips on how to reduce their footprint.. Most of us would not question the necessity of electricity in modern life, but many people nevertheless do not wholeheartedly support the technologies and fuels used to generate it. In the US (as per the chart to the left), the bulk of the electricity generated still comes from coal-fired power plants, although coal’s share of the power generated has declined slightly over the past few years due to the shale gas boom, which has made natural gas plants comparatively inexpensive to run. These two fossil fuels combined account for well over half of the electricity generated in the US. Meanwhile, the contributions of nuclear power and hydroelectric power to the energy mix have remained more or less unchanged since the turn of the century. Following up the rear is wind power, whose slice of the electricity pie, while having grown significantly in recent years, is still only a tiny sliver. Solar power, although now present and growing in the real world, is still so small as to not be visible in the graph. Of course, the exact energy mix varies depending on the region of the US in question. 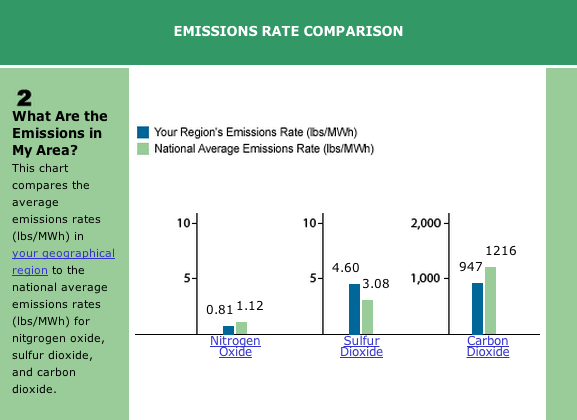 The EPA’s Power Profiler tool lets users see their region-specific results based on their zip code and utility company. 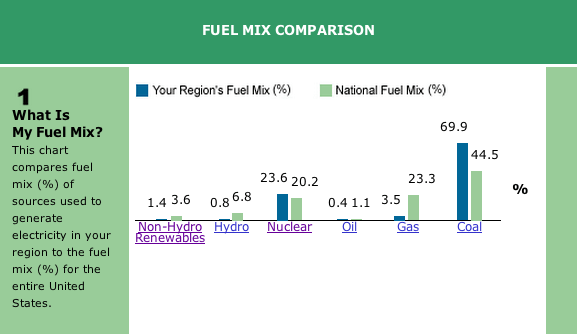 For example, entering the zip code for Radnor, PA (19087–home to Community Energy HQ) and selecting PECO Energy Co as the utility reveals that the average household in the area gets its electricity mainly from nuclear and coal plants (chart below). Looking further west to Pittsburgh, the results are significantly different–with nearly 70% of the power coming from coal (chart below). This is how Pennsylvania has earned a reputation as ‘ground zero for climate change‘. Plugging in other zip codes to the EPA’s tool will yield different results, and users may be surprised by what they learn. Try it and find out what the electricity mix is for your home. 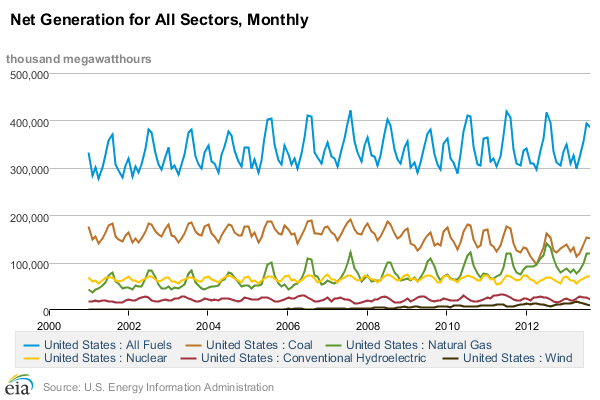 What’s so bad about coal, nuclear, and gas power? Unless you live near a power plant, the problems associated with our current electricity generation infrastructure are likely ‘out of sight, out of mind’–but they are real. We’ve discussed some of the downsides of coal & gas-fired power generation here on the Community Energy website, but the EPA makes further information about each of these and other fuels easily accessible, with links leading to pages detailing their pros and cons from the reports that the Power Profiler generates for users. Upon visiting the EPA’s page about nuclear power, for example, it is possible to learn (if you didn’t already know) that although nuclear plants contribute to air pollution (as the fuel is not burned), their usage of water for steam and cooling still results in increased levels of heavy metals and other pollutants in the bodies of water upon which they draw. In addition to this, there is the issue of spent nuclear fuel, for which no permanent disposal sites are available. For now, it is kept on-site in temporary storage facilities. If you live within close proximity to a nuclear plant (or even if you don’t), you may find this information at least a bit unsettling. Depending on the fuel mix of your region, the type and volume of emissions will vary. The Power Profile gives an explanation of what these emissions are and why they are bad. Carbon dioxide–a product of burning fossil fuels–is currently the most talked-about gas emitted in energy generation thanks to its role as the major driver of climate change. Sulfur dioxide and nitrogen oxide (NOx), however, are 2 other gases that also have negative environmental and human health impacts (mainly the respiratory system). The former is also well-known to cause acid rain. You can learn more about these on the EPA’s site. Want to learn more and empower yourself to act? Check out the EPA’s Power Profiler and find out more. The data presented in the results is slightly out of date (2009), but it is nevertheless useful and actionable even now. 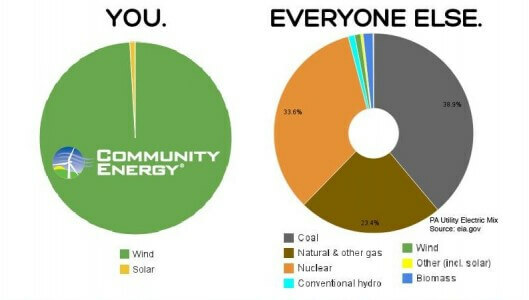 Community Energy supplies its customers with 100% renewable wind & solar electricity. If you’ve had a look at your electricity supply and don’t like what you see, sign up for green power through us. Making the switch is easier and cost less than you may think, and thousands of households across the country have already done so.